I am a bit of a statistics enthusiast who often wonders about the difficulties in conducting very large experiments. Therefore, what the folks at OkCupid are doing is very interesting to me. This illuminating insight is a must read. While the article is brilliant, here are a couple of points not specifically noted there. 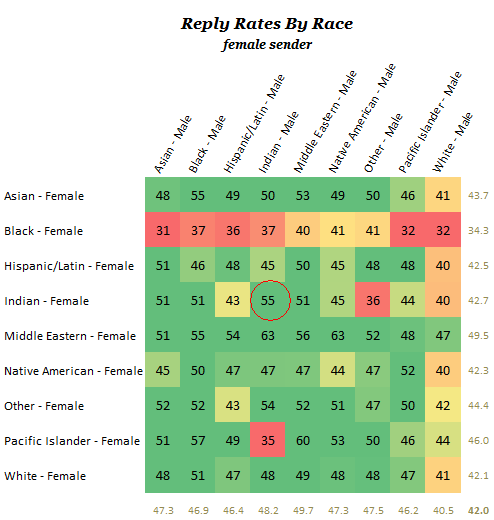 Indian Males are the least replied to racial subgroup on OKCupid. 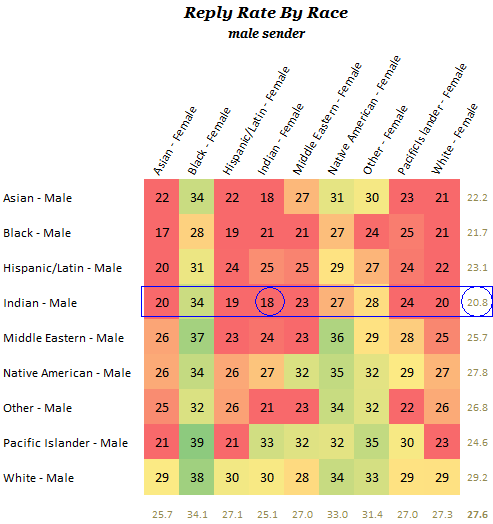 If I make a disputable correlation with attractiveness, in an as widely represented pool as OKCupid’s, Indian Males are the least attractive racial group. While Indian Males are the highest replying recipients for messages from Indian Females, the group that responds most poorly to Indian Males is – Indian Females. There are only three ways of being truly appealing to a woman. Kindle the mother in her, kindle the father-void in her or kindle the part of her which wants to be reassured that she’s capable of attracting.